Shawn Nichols and Sam Johnson stand beside the bird feeder they donated to Freedom’s Path. Johnson said the veterans like to sit outside and watch the birds. On Saturday, Sept. 22, there will be a motorcycle ride from American Legion Post 25 in Washington C.H. to the traveling Vietnam Memorial Wall that will be set up in Chillicothe from Sept. 19-23. The ride will begin at 5 p.m., but participants should get to the Legion Post between 3 and 4 p.m. to line up. After visiting the wall, participants will ride back to the Legion Post, located at 1240 US 22, where local bands “Damaged” and “Screaming Evidence” will put on a concert. In addition to paying their respects at the wall, participants in the ride will be asked to bring items to donate to the veterans living at the Chillicothe VA assisted living facility, which is called Freedom’s Path, and the homeless shelter. Johnson and Nichols are looking to collect everything from canned goods to cleaning supplies to dog food and bird seed. In addition to the bands that will play at the Legion Post once the riders return from the wall, Nichols and Johnson have invited a number of veterans’ organizations to set up tables where they can share information about the services they offer to veterans. 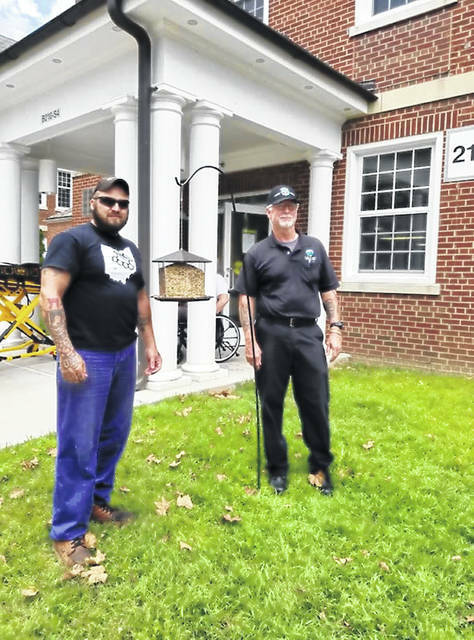 https://www.recordherald.com/wp-content/uploads/sites/27/2018/09/web1_veterans-photo.jpegShawn Nichols and Sam Johnson stand beside the bird feeder they donated to Freedom’s Path. Johnson said the veterans like to sit outside and watch the birds.